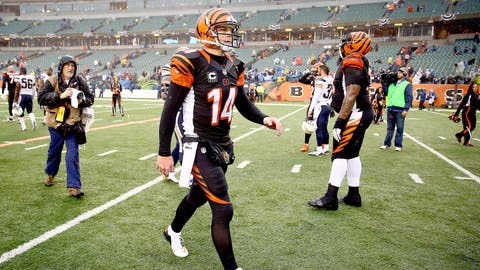 Should Andy Dalton receive all the blame for the Bengals’ collapse? Andy Dalton has earned a reputation of being a quarterback who can’t get it done in the most pressure-packed moments. In a wild-card playoff loss to San Diego on Sunday, the Bengals quarterback threw two ill-advised interceptions and wasn’t able to consistently put the ball in his best playmaker’s hands. What’s worse is on a crucial drive in the final quarter he failed to convert a fourth-and-3 because he opted to let it fly. The pass was overthrown and the ball was turned over on downs. Questionable play call or poor execution? Probably both. More opportunities presented themselves, but the Bengals could never find their footing and a 58-yard Ronnie Brown touchdown run in the fourth quarter sealed the Chargers’ 27-10 win. Dalton, who threw the first postseason touchdown of his career to tight end Jermaine Gresham, was mostly ineffective on Sunday. Oftentimes Dalton didn’t have a clean pocket in which to operate, which caused some balls to sail wide or over the intended receivers’ hands. Naturally, Dalton has been piled on because of the wealth of weapons surrounding him and his inability to win games when it matters most. One thing is for sure, Dalton is a streaky quarterback. When he’s good, he’s great. And when it’s not his day, he’ll turn the ball over on multiple occasions and have people wondering if he truly can ever get the Bengals over the hump. But should Dalton solely be held responsible for the Bengals’ collapse? Of the Bengals’ 12 meaningful drives, the offense was able to move the ball inside the red zone three times. Only once were they able to punch the ball in for a score. Leading into this game, rookie running back Giovani Bernard was tabbed as Cincy’s secret weapon. A potential game-changer. And why would we think anything else as the running back proved his worth throughout this season? With a chance to take a lead in the second quarter, Bernard coughed up the ball at the Chargers’ 16-yard line. The fumble, which was reviewed and confirmed, stalled the Bengals’ drive and put their hopes of winning their first postseason game in 22 years on ice. The course of the game would never be the same. Bernard finished the game with 12 carries for 45 yards and was a factor in the passing game, nabbing seven balls for 73 yards. His counterpart BenJarvus Green-Ellis had just eight carries for 42 yards. Maybe at 4.5 yards a carry, Bengals offensive coordinator Jay Gruden should’ve built a game plan around his running game? Then again, Gruden is extremely confident in his third-year quarterback. "He’s won 30 (bleeping) games, man. How many does he got to win?" Gruden said earlier this week via USA Today. "He’s beaten (Tom) Brady. He’s beaten (Aaron) Rodgers. He’s beaten (Ben) Roethlisberger. He’s done it all. "We’ve just got to do it in the playoffs, and that’s to be determined. But even if something happens where there’s turnovers or bad referee calls (and) we don’t win the game, I don’t think you can discount what he’s done the last three years as the starting quarterback." Chargers defensive coordinator John Pagano did a masterful job of taking away A.J. Green. The three-time Pro Bowl receiver hauled in just three receptions for 34 yards on nine targets and was relatively unheard of for most of the day. If you need a good reason why the Chargers, and not the Bengals, are advancing to the AFC Divisional Round, it’s because San Diego came into Paul Brown Stadium and took the game away. The Chargers grinded out 196 yards on the ground, mostly by way of the trio of running backs including Ryan Mathews, Danny Woodhead and Brown. They won the one-on-one matchups at crucial moments, especially on a beautiful corner fade route by second-year tight end Ladarius Green for a touchdown in the third quarter. Philip Rivers was effective when called upon, but it was simple. The Chargers wanted to run the ball, own the time of possession and create timely turnovers. They did all three. Dalton, surely, contributed to the end result. But the Bengals were beat by a team of players, who precisely executed their game plan and played opportunistic football.